← Outfit and Jewelry Ideas for Spring! The 150 Carat Diamond Dream Ring! I saw this on the news last night and was pretty blown away by it. The Geneva, Switzerland jewelry designer Shawnish, designed a diamond ring, that’s been carved entirely from a giant diamond! The ring weighs in at an incredible 150 carats! 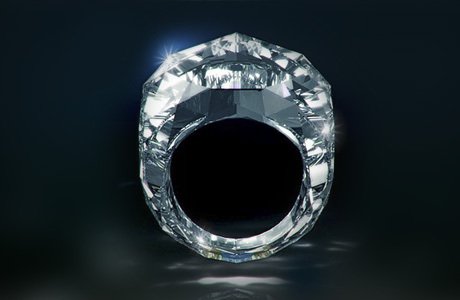 The unique way he created this stunning showpiece was based on using lasers to cut through one single diamond stone which formed the upper portion of the ring structure. The same stone was then carved out creating the circular shape goes around the finger, creating the ring itself! This entry was posted in Jewelry, Jewelry News and tagged 150 carat diamond ring, diamond ring, Jewelry, jewelry warehouse. Bookmark the permalink.